As promised, BarberQue 2017 was bigger, badder, and better. The line at the registration tent was 50 people deep by 11:30 – the event started at noon. 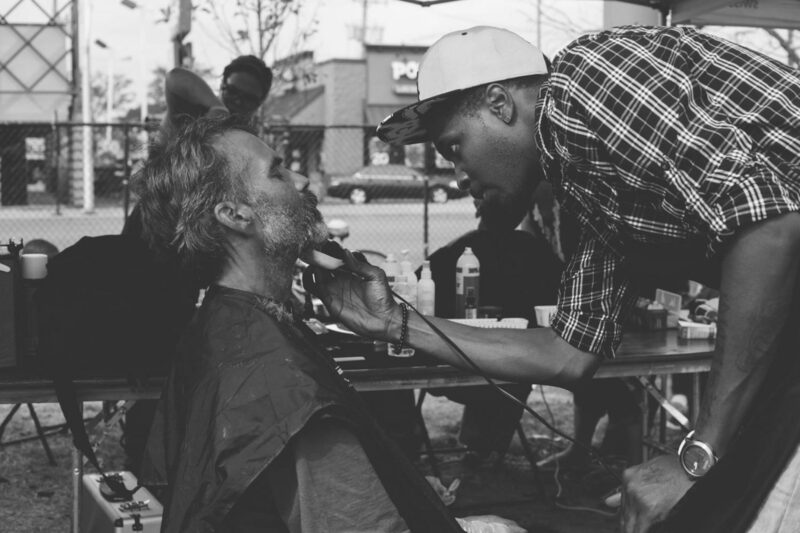 Over the course of the day, we estimate that the BarberQue crew fed 500+ people and gave over 160 haircuts. The clothing giveaway station was OUT. OF. CONTROL. Your generosity allowed us to give away more than double the clothing given away last year. Thank you so much to everyone who helped make this day possible. Be it donating financially, baking ahead of time, slaving at the grill, smiling at the food line, greeting participants as they enter the park, or the billion other ways you folks support this event, we could not do this without you. YOU are BarberQue. YOU make this possible. YOU are the real superheroes here. As last year, Megan, Izla and I leave this year awestruck and humbled. The wonderful people that surround this event constantly blow our minds, and we are honored to have been able to be a part of this day with you. To view photos of the event, visit our Facebook page.